This product can be used by any skintype. 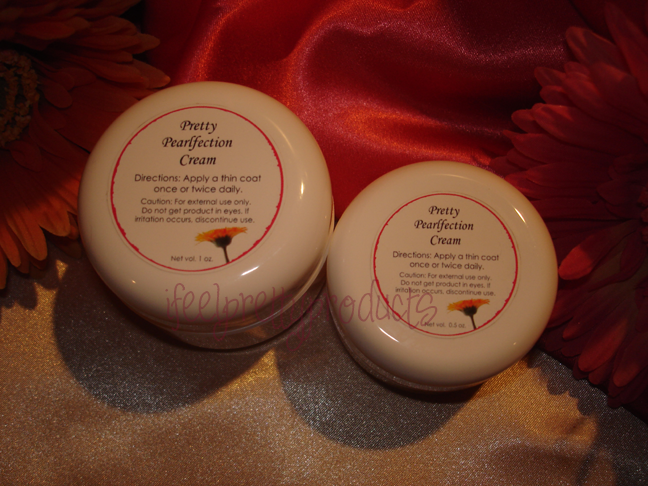 This is the original formulation of the Pearlfection Cream and is only available in 0.5 oz. jars. Once these jars are gone, the original formulation will be discontinued. 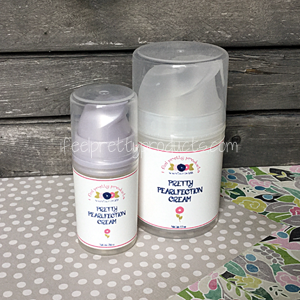 This is the new formulation of the Pearlfection Cream, and I think you'll love it! It has the same ingredients, but the consistency is a little thinner and easier to apply. Best of all, it is now packaged in an airless pump bottle! There are two sizes available, and since one is a smaller half ounce size, there will be no "sample" size for this product. The original formulation can be applied with or without water. If you like a more moisturizing cream, I recommend you apply it straight from the jar. If you prefer a lighter cream with more of a matte finish, then I recommend you use a smaller amount of the cream & apply it with a little water. The new formulation should be applied "as is", although there is no problem with diluting it if you like. It is normal for your skin to feel ‘tight’ for a few minutes after applying the Pearlfection Cream. It is not drying your skin – this is the way the pearl powder feels as it tightens your skin & clears your pores. How to use: Apply a thin layer to face (and neck, if desired) once or twice daily. If you would like an extra boost of hydration, you can add a drop or two of your favorite facial oil to the Pearlfection Cream before application. Keep in mind - a thin coat works best - especially if you are trying to cut down on oiliness. Remember - the key is to apply a THIN layer of the Pearlfection Cream - more is not better if you want a matte finish. Ingredients:	water, pearl powder, calendula, lavender, & raspberry leaf infusions, cetearyl alcohol (and) polysorbate 60, hydrolyzed silk, watermelon seed, raspberry seed, & cranberry seed oils, hyaluronic acid, iris florentina extract, tocopherol, liquid germall plus, tangerine, lavender, & geranium essential oils. Iris florentina extract - stimulates skin to compensate for decreased metabolic activity due to aging. Reduces the depth of wrinkles, improves skin hydration and elasticity for an overall improvement in skin tone. Red raspberry seed oil - excellent antioxidant, has superior anti-inflammatory properties, & studies indicate that it may act as a broad-spectrum UVA and UVB shield. (but please continue to use a broad-spectrum sunscreen). Cranberry seed oil - has a natural balance of omega 3, 6 & 9 fatty acids not found elsewhere in natural oils. Also rich in Vitamin E and other natural antioxidants. Watermelon seed oil - highly penetrating oil that absorbs quickly & is highly moisturizing. It is rich in omega 6 & 9 fatty acids. Can help to dissolve sebum build-up.